I love this weeks prompt mainly because I love tattoos. Currently, I have about 24 of them and my goal is to cover my legs all in geeky/pop culture related things, so this one is right up my alley! 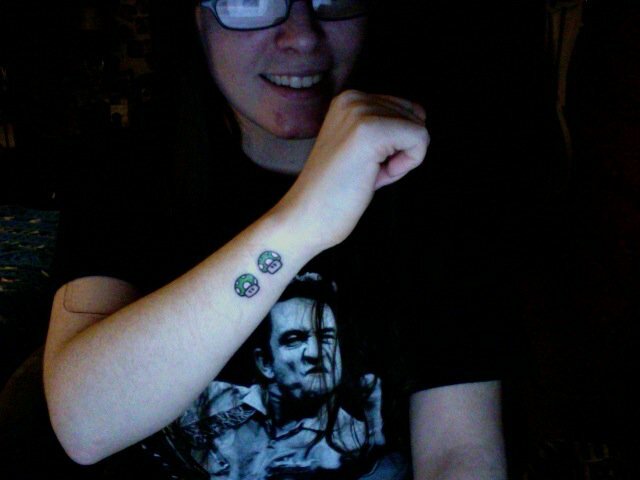 I've always been a big fan of tattoos ever since I was little. I've always found them so beautiful and such a great way of expressing yourself. I didn't start getting tattooed until I was about 20, and I've been going to the same girl now for 7 years. She knows the style that I love and doesn't even bat an eye when I come to her and tell her I want silly things like a fancy shark with a top hat. I always get a ton of joy out of getting tattooed, and I honestly don't find them too painful (I mean, yes obviously they aren't pleasant, but I don't find them totally unbearable). I'm also one of those people who tends to make an appointment for another right after I've just finished getting one; I just have so many ideas! ... aka I'm sorta addicted, oh well! The majority of my tattoos are on my legs (with the exception of a few on my sides) because they're easier to hide that way if I ever needed to. Luckily, my job loves them and the people there will literally line up at my desk to see anytime I get a new one. Anyways, here's just a little sample of the ones that I have! 1. 1-up Mushrooms: I grew up playing Super Mario Land on GameBoy and anytime I couldn't pass a world (usually the underwater world), I would hand it off to my Mom and she would beat it in about 5 seconds flat. I ended up getting two of these, one for her and one for my brother because they're the two 1-ups in my life. 2. 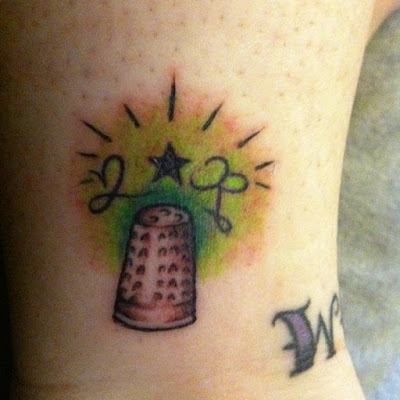 2*R: I've always loved Peter Pan and have always wanted to go to Neverland, but I kinda didn't have the space to fully write out "Second star to the right", so I just abbreviated a tad and added the thimble in for good measure. The colors behind it are actually dark and light green, but this was taken right after I had it done so it was super fresh. 3. 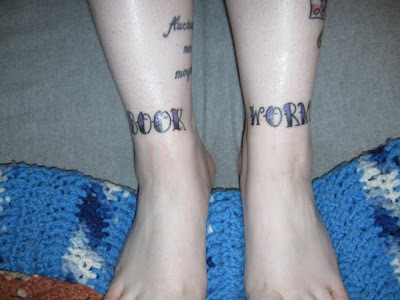 Book Worm: I like big books and I cannot lie. Also, looking at the "W" in this always makes me happy because my girl put a little swirl on it and when you mix that with the purple color, it reminds me of the Wonka logo. 4. 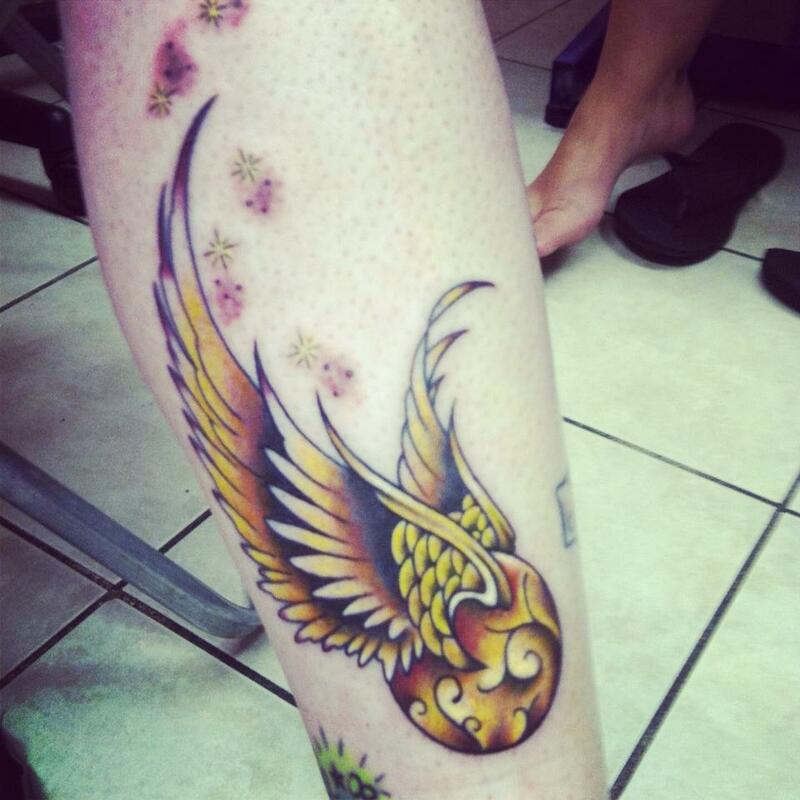 Golden Snitch: I love Harry Potter. Like, a lot. Coincidentally, I had also gotten this tattoo on July 31st, which is Harry Potter's birthday. 5. 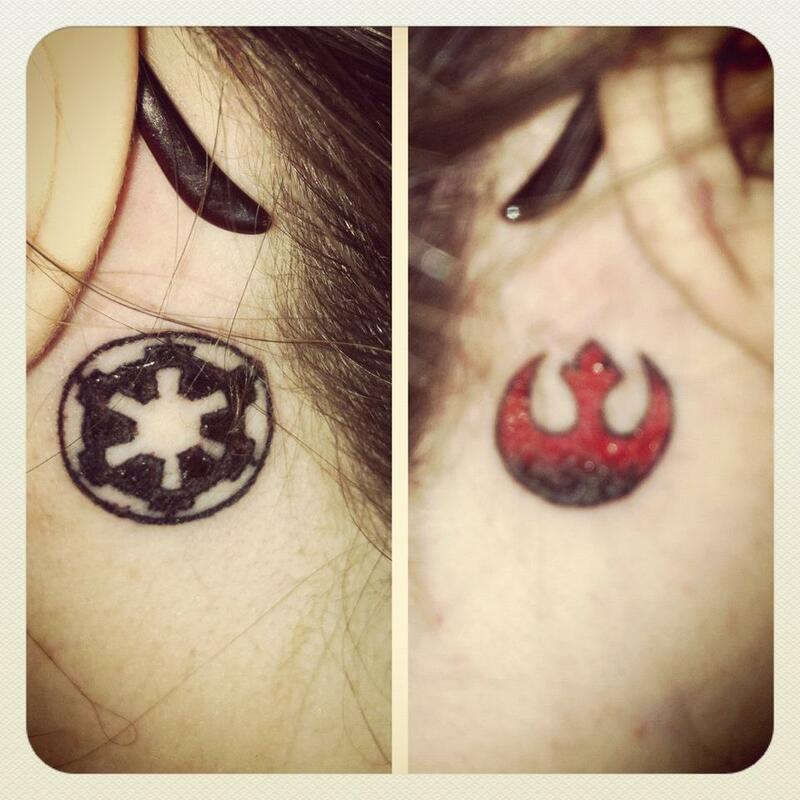 Empire, Rebels and Lightsabers, oh my! : I couldn't decide between which one to post, so I just figured I'd do both. 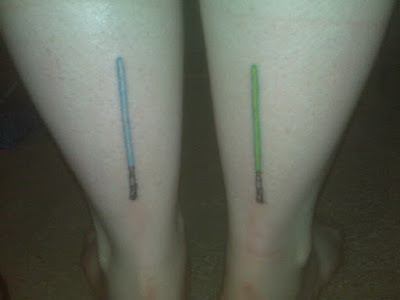 The lightsabers were actually the third tattoos I ever got, and then I had gotten the Empire and Rebel Alliance logos a year or so after. If you hadn't already figured out from some of my older posts, I'm a huge Star Wars fan and I actually have plans for quite a few more related tattoos as well. Also, the hilts of the lightsabers are actually straight, it's just super wonky trying to get a picture of the back of your own calves. 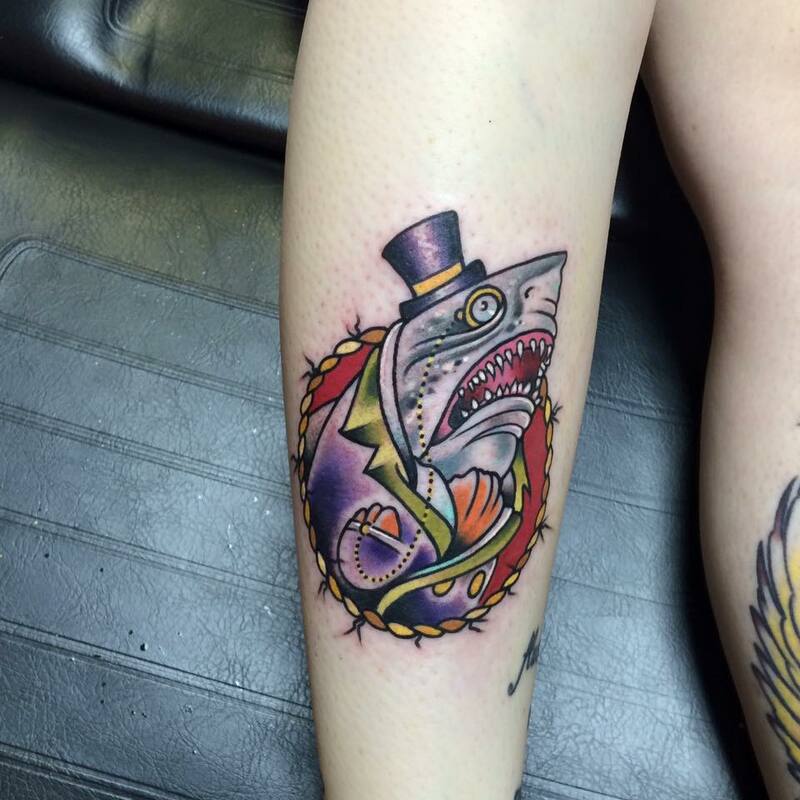 My fancy shark. Just cause I mentioned him briefly at the start and he's just too good not to show off. Hope you all liked some of the nerd art I have!